Virgo is an exceptionally large constellation which is located directly on the ecliptic (the line which the Sun follows across the sky over the course of the year), because of this it belongs to the 12 signs of the zodiac. One of the most outstanding features of the constellation Virgo is the large Virgo cluster of galaxies, which consists of approximately 2,000 galaxies. Virgo is an unusually large constellation, second only to the constellation of Hydra in its proportions. Virgo is positioned between the constellation of the Lion (Leo) and the constellation Libra (Libra). In formation, Virgo appears like a woman in a sitting position. 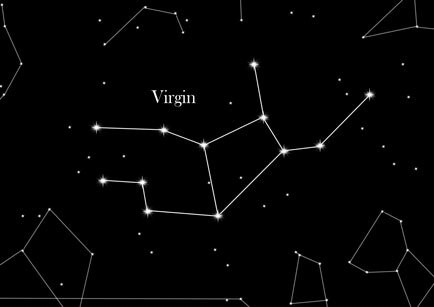 There are two popular myths which explain the origin of constellation of Virgo. In one Greek myth, Persephone the fertility goddess and a virgin is kidnapped one day by Hades the god of the underworld. Her mother Demeter tries in vain, to find her and finally decides to ruin the harvest out of despair. In an effort to appease her, Hades lets Persephone return each year in the spring in order to help her with the harvest. This explains the appearance of the constellation Virgo, which is only visible between the months of March through to August every year. Continuing with the virginal theme, the goddess Astraea, the daughter of Zeus, the King of the Gods, grows tired of man’s endless warring and decides to ascend to heaven, thus becoming the constellation of Virgo, where she holds the scales of justice (Libra), in her hands. Astrological significance: The star sign Virgo is an Earth sign, and like all Earth signs, people under its sign are down to Earth and practical in manner. In particular Virgo people like order and due procedure, they tend towards perfectionism and are intolerant towards frivolous behavior.